No, a guinea pig cannot fly but when they do, cows will colonize the moon! This question is known as an adynaton, a figure of speech so farfetched it describes an impossibility. So let's rephrase this: Why can't guinea pigs fly on a plane? Airline Officials usually give two reasons for this policy and they are (1) A safety issue. Guinea pigs aren't required to get vaccinations and (2) Logistics. A guinea pig or other small critter would be difficult to catch if it compromised it's pet carrier. So what can you do when you're moving or traveling and you want to take your guinea pig with you on a plane? If you're just going on vacation it's best to leave your little pet with a friend or relative because unlike small dogs and cats, people run into trouble with most airlines when trying to book a flight with a guinea pig! TSA security does not prohibit you from traveling with your pet but never allow your guinea pig inside the carrier or cage when passing through the X-ray machine. Remove your pet from the cage and hold it close to you when passing through the metal detector. You can wrap it in a towel if it stresses, but keep in mind, the TSA officers are looking for suspicious mannerisms and they do reserve the right to conduct a visual and physical inspection of your guinea pig if they deem it necessary. Talk about stressing your guinea pig! When traveling with your guinea pig it's best to plan in advance. Guinea Pigs are small, fragile animals that are susceptible to noises and temperature changes, so for these reasons they should never travel in the plane's cargo or luggage areas. Many airlines allow cat and dogs to fly in the cabin but few airlines allow guinea pigs on board. Making arrangements with the airline at the time of booking your flight is extremely necessary, so when you're booking your ticket, mention your other little traveler. Your destination is another factor for consideration. For instance, Hawaii has quarantine restrictions and may not allow you to take your guinea pig with you after you disembark the plane. The U.S. Department of Agriculture's rules and regulations should be checked if you're flying within the United States. An airline approved pet carrier for guinea pig transportation is a necessity. You may want to line the carrier with soft towels or blankets to keep your guinea pig comfortable. In winter time it's best to line the carrier with fleece. A small sack or some type of hiding place will be good to include also so your guinea pig has a place to retreat where it can feel safe. Choosing the proper size carrier is also important. It should be large enough for your guinea pig to move around, lie down and turn around without any problems. Be wary of larger carriers however, because not only can a larger carrier be scary to your pet but it can be life threatening if it is tussled around or falls as there is too much room in it for the animal to be turned about and hurt. The Transportation Security Administration (TSA) has restrictions on carrying a water bottle onto a plane so it's best to bring a number of snacks like carrot slices, lettuce leaves and water rich foods such as tomatoes and cucumbers along with the pellet food. On short flights you can place a few snacks inside the carrier but for long flights you can feed your guinea pig every couple of hours. Sprinkling water on the carrots and lettuce is a good tip for providing hydration for your little furry pal. If you do supply your pet with water outright, don't set the water in the carrier in a bowl where it can spill - this may cause your pet to catch a cold! Stress Could Create a Mess! 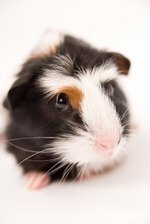 Guinea pigs don't require any type of travel vaccinations but an airline may request a good health certificate from your vet before entering your cabin so be sure to check beforehand. You also have to be certain of your pets temperament when you travel. A high strung animal is not going to travel well and may experience stress while traveling. On the other hand, other guinea pigs may adjust easily to their surroundings and sleep the whole trip. Minimizing stress is the key to a peaceful flight for both you and your pet. Below is a list of airlines and their pet travel regulations, courtesy of GoPetFriendly.com.